This entry was posted in Engaging Tasks, Higher Order Thinking and tagged Good Teaching, instructional Strategies on July 15, 2013 by Mike Muir. You have been hired by Paramount’s King’s Island to research the roller coasters of Ohio, and then to come up with an idea for a new coaster. King’s Island wants to build a new roller coaster, but needs to know what its competition is. It also wants you to examine its existing coasters to see what types of coasters it does not have. After you examine the competition, you will come up with an idea for a new coaster. You will submit this idea in writing and also with a drawing. Engaging Tasks are an easy-to-implement, real world learning strategy. Instead of simply assigning a task or assignment to the students, an Engaging Task tells a little story (only a paragraph or so!) that gives the students a reason for doing the work. If this is a good one, what makes it good? Does it relate to your curriculum? Is it Standards-based? Will students find it authentic or believable? Would students find it interesting or of significance? Lets look at this example through the lense of these six criteria. Standards-based: Like many Engaging Tasks, this one comes from a WebQuest (that is no longer published online). In the Teacher Section of this WebQuest, the teacher/author explained that it is an upper elementary assignment to apply learnings from physics. But looking at the (no longer published) Process Page and Resources Page showed that the content could also be data collection and data analysis. If you were teaching Complex Reasoning, it could also be an exercise for a student to demonstrate prowess in analysis or design. All 3 pieces – Scenario, Role, & Task: An amusement park wants to build a new roll coaster. The students are roller coaster designers. They have to analyze the competition and design a new roller coaster. Yes, all three pieces. In the form of a “story”- no “teacher talk”: Yes, this Task just tells the story. All the specifics, directions, and resources are saved for the Process Page and Resources Page in a WebQuest. In other kinds of engaging tasks, they can be separate parts of the handout. HOTS – Apply, Analyze, Evaluate, Create: Yes, students have to analyze data that they collect, and create (design) a new roller coaster. Students: authentic or believable: These students will be using real data from real amusement parks. If this was produced for students who live near these Ohio amusement parks, the Task is even more authentic! Students: interesting or of significance: Students love roller coasters (or at least watching others on roller coasters)! It’s not unusual for a class to have a field trip to an amusement park as part of working on a project like this. So it looks like this Engaging Task does a pretty good job of meeting the criteria! This entry was posted in Engaging Tasks, Higher Order Thinking and tagged instructional Strategies, interests/Interesting, WebQuests on July 14, 2013 by Mike Muir. Here is an example of an Engaging Task. It is modern day, and you are on the jury for the trial of Macbeth. Macbeth is being tried for the murder of the King. You will be deciding whether or not Lord Macbeth is guilty or innocent, and how he should be held responsible for his actions. Be prepared to defend your decision to the other jury members. Take a second and look at the example above. What’s the compelling scenario? What’s the context for the student’s work? What’s the role of the student? Who is the student in the story? What is the thing that the student has to do? What is the student expected to produce? So what did you decide? What did you say the scenario was? The trial of Macbeth? Who is the student? Did you say juror? And what does the student have to do? Did you say decide on guilt or innocence? Notice a couple other things, too. Our little story is just a story and the student is just a character in that story (there is no reference to the class, or to the student being a student – they are just other jury members). And there are no directions in our little story (put step by step directions in a separate document). Part of what makes Engaging Tasks engaging is the fact that the student’s imagination is turned loose in the task. Just like you don’t want to go to a Civil War reenactment where the soldiers are wearing sneakers, you don’t want your class or assignment sneaking back into your Task. You can explore tasks by browsing through Webquests. See if you can identify the scenario, student role, and thing to do in each. 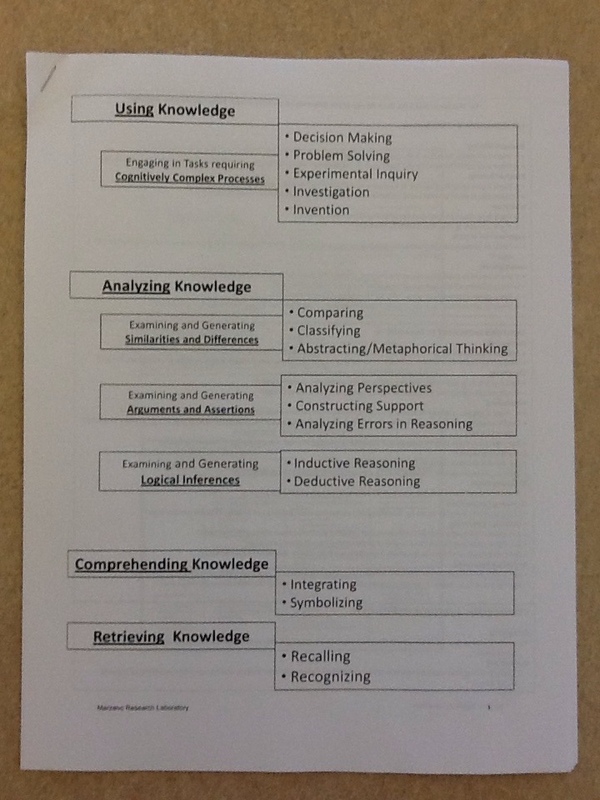 This entry was posted in Engaging Tasks, Higher Order Thinking, Real World Connections and tagged instructional Strategies on July 13, 2013 by Mike Muir. Are you looking for a teaching strategy that can hook and engage your students? One that can work with almost any content area? Then you’re looking to use an Engaging Task. Engaging Tasks are an easy-to-implement real world learning strategy. WebQuest.org – THE place for everything about WebQuests – defines a WebQuest as an inquiry-oriented lesson format in wich most or all of the information that learners work with comes from the web. Some educators mis-identify a WebQuest as a series of low-level questions that students use the web to track down answers to, but this is far from a WebQuest. WebQuests require that students apply higher order thinking strategies. The idea of WebQuests was developed by Bernie Dodge and Tom March. In my opinion, the part of a (good) WebQuest that makes it so engaging is the task. What makes a task so engaging? This entry was posted in Engaging Tasks, Higher Order Thinking and tagged Student Engagement, WebQuests on July 12, 2013 by Mike Muir.